The objective of a wire rod mill (WRM) is to reheat and roll steel billets into wire rods. The production of wire rods in wire rod mills is subject to constant change. The growing demands on the quality of the wire rods as well as on the flexibility and cost effectiveness of the wire rod mills has necessitated the development of new and innovative technologies and processes. Modern wire rod mills are high speed mills capable of rolling of smaller dimensions at high production rates, while at the same time keeping investments and operating costs at the reasonable levels. As a rule, wire rod mills are designed for an annual output of between 300,000 t and over 800,000 t (two strand mills). The mills are capable of rolling at speeds ranging from 50 meters per second to 120 meters per seconds. Typical product sizes are within the 5.0 mm to 20 mm range. The range of materials comprises low to high carbon steels, cold heading steels, wire drawing steels, alloy steels, spring steels, ball bearing steels, electrode quality steels, reinforcement bars and tool steels. Modern wire rod mills are expected to meet the following requirements. Close dimensional tolerances of wire rods in the range of +/- 0.10 mm and ovality in the range of around 0.2 mm. Low scale loss in wire rods of around 0.5 % to 0.6 %. No variation in dimensions throughout the length of the rod. Uniform weight with nominal variation between middle and back end. For achieving these demanding requirements, many important features are incorporated in the modern wire rod mills. Some of these are described below. Reheating furnace – Modern wire rod mills are equipped with energy efficient walking beam furnaces or walking hearth furnace which are normally computerized controlled. These reheating furnaces uniformly heat the billets to the target temperatures at the required production rates and without skid marks and without cold spots. These furnaces are capable of receiving cold or hot billets as the charge material in the furnace. Housingless roll stand – The housingless (HL) roll stands are used normally in roughing and intermediate group of stands in modern wire rod mills. The modular design permits the use of HL stand cassettes in all possible configurations such as horizontal, vertical, tiltable and universal configuration. The stand sizes differ, depending on the necessary dimensions of the rolls and roll journals, pass schedule, pass form as well as the gearbox and motor characteristics. The main features of the HL stands are compactness and rigidity of components, low roll bending modulus, durable multi row roller bearing with self aligning chocks under load, backlash free balancing of chocks, roller beams designed for simple and exact adjustment of guides and guards etc. The advantages of theses stands include (i) saving in the depth and size of the foundation (ii) the rolled product meets the required form and dimensional tolerances, (iii) there is time savings for stand changes as the roll changing takes place outside the rolling line, (iv) there is significant reduction in time for maintenance due to lesser number of components and easier accessibility, (v) automated roll gap adjustment, and (vi) operational flexibility since the same stand unit can be used in any position. Cantilever roll stands – Cantilever (CL) roll stands are compact stands which are used in a wide range of sizes for a variety of applications. These applications include (i) single strand mills in horizontal and vertical arrangement, (ii) in split intermediate trains of two or more strands mills, and as prefinisher stands in wire rod delivery sections. The advantages of these stands include (i) Smaller foundations; (ii) cassettes of the same stand type are interchangeable even between horizontal and vertical stands, (iii) high load bearing strength even with small diameters hence ideally suited for high speed wire rod blocks, (iv) optimum accessibility, and (v) fast roll and stand changing. Cooling and equalizing loop – The material entering the no twist block must be intensively cooled for final rolling at low temperatures. This must then be followed by a sufficiently long equalizing section to allow the metallurgical properties to be achieved uniformly over the cross section of the finished wire rods. Without equalization section, the temperature difference between surface and core can be so large that different micro structures can be created during the subsequent forming process. On the other hand, there are the steel grades that have to be rolled as hot as possible and for which a long equalizing section leads to deterioration in quality. The loop technology allows these two demands to be perfectly reconciled. The material from the intermediate train can take the short direct route or the route via the loop with additional water boxes and long equalizing sections before being rolled in no twist blocks. No twist block – It is also known as no twist mill. In wire rod mills, it represents one of the key elements. Only through this development, it has become possible to safely roll thin wire rods at speed of over 120 m/sec. The no twist blocks can be of 4, 6, 8, and 10 roll stands for twist free rolling. A primary gearbox drives the roll units via two common shafts. No twist blocks having two different sizes of roll units are available, with ? 170/150 mm rolls and ? 223/200 mm rolls. All roll units are identical and interchangeable. No twist blocks are available with reduction ratios varying from 10 % to 25 % per pass, depending on steel grades to be rolled. The block is now even designed for a speed of 150 m/s. No twist blocks uses tungsten carbide rings having a pass life of 600 t to 700 t with super finished surface of the end product. The advantage of the no twist blocks are (i) ultra heavy duty housings, (ii) low ring changing time, (iii) negligible spring action, (iv) reduced maintenance, (v) simpler section control, remote adjustments under load, and (vi) flexibility of rolling of different wire rod grades. Flexible reduction sizing (FRS) block – This block has been developed by SMS Meer for rolling higher grades and simultaneously improving the metallurgical properties of the rolled product. This is a four strand block with speed shift gear boxes. It is installed down line of a no twist wire rod block. On the FRS block all dimensions can be finish rolled with the advantage one family rolling, which means that only one pass size is used in each stand over the whole size range. Due to the cooling section in between the no twist block and FRS block thermo mechanical rolling becomes feasible. There are many good design features in this block. Reducing sizing mill (RSM) – It is a versatile sought after rolling technology. RSM takes advantage of the special features of the 3-roll technology, in which the spread during deformation is low and the deformation efficiency is high. The advantages of the wire rod reducing sizing mill are many. It can be integrated after a conventional finishing block, boosting the mill productivity on small sizes by up to 60 %. Its extreme precision has been proven in many practical applications. The pass design is patented and enables true single family rolling from the first stand after the reheat furnace to the last stand of the block ahead of the reducing sizing mill. Added after a conventional rod finishing block, the patented RSM unit can significantly increase finishing speeds on smaller sizes. Thermo-mechanical rolling – It is also known as low temperature rolling and is basically a method for on line control of the final material properties during the rolling process. It involves material deformation applied at the last passes of the mill, within the temperature ranges corresponding to partial recrystallization or to suppression of recrystallization. As soon as recrystallization is suppressed, grain refining phenomena occurs, resulting in improved technological properties of the final wire rod product. In addition, the rod surface quality improves considerably. The advantages of thermo-mechanical rolling are fine grain size, avoidance of off line normalizing, improved low temperature toughness, better properties after heat treatment for case hardening steels, shorter annealing time for spring steel, improved fatigue strength on the final component, higher tensile strength for micro-alloyed steels achieved directly in-line, and reduced decarburizing depth etc. The use of two blocks (usually a six stands and a four stands) allows all the dimensions of the wire rods to be rolled thermo-mechanically and inexpensively with high production rates. By splitting the no twist block, it becomes possible to finish roll in four passes maximum. With sufficient cooling and good temperature equalization over the cross section, thermo mechanical rolling at high production rate is thus possible. Cooling and equalizing loop before the no twist block plays an important role during the thermal mechanical rolling. It allows the ingoing temperature into the first no twist block to be reduced to 750 deg C and that with a temperature profile of less than 50 deg C. This precondition of reaching 750 deg C again before the second no twist block for the sections to be rolled with ten passes become feasible and hence making thermo mechanical rolling possible even with small dimensions. Drive for no twist block – Normally all the stands of a no twist block have complex gear box configurations which are subject to wear and maintenance. They are driven jointly by one or more huge motors (up to 7000 kW) in tandem arrangement via a primary gearbox and two common shafts. No twist block has limitation since it can able to roll with fixed reduction ratios which require fix roll ring diameters. SMS Meer has developed an electronic gear box which controls the motors of a no twist block relative to one another so that that the stands function like a no twist block and can be more precisely controlled. This drive has been named as MEERdrive and due to it the fixed reduction ratios between the stands are eliminated. This helps in roll sizing as a wide range of different area reductions can be rolled in the same stand. The roll ring management also gets simplified and the number of passes required can also be reduced. Loop laying head – The laying of different wire rod sizes in uniform loops with the loop laying head even at high rolling speed is an important criterion. Further due to thermo mechanical rolling for many grades the laying temperatures for certain grades are greatly reduced due to metallurgical reasons. This has put more demands on the laying head particularly the laying tubes and they are to be made of special material. Control cooling conveyor – The controlled cooling conveyor system is one of the important parts of a wire rod mill for achieving the desired properties of the wire rods for a wide range of different steel grades. The optimum combination of speed, fan power and cover position on the conveyor enables processing in a wide range of conditions, including both fast and slow cooling modes within a single system. This capability enables wire rod mills to produce a broad spectrum of plain carbon and alloy steels, as well as stainless steels and other specialty grades. During ‘forced cooling’, air is blown through the loosened windings with maximum manpower and open covers to cool the wire rods as quickly as possible in order to achieve the laminar pearlite. During ‘delayed cooling’, the wire rod loops are transported without fans, with the cover closed and at low conveyor speed in order to keep the temperature in a given range for as long as possible. This enables achievement of a ferritic/pearlitic microstructure of the wire rods. The results are improved as rolled rod properties. This enables the production of more grades in a directly usable condition, thus reducing or eliminating downstream processes, such as spheroidize annealing. Reform ring distributor – The reform ring distributor collects rings high in the reform tub using a rotating blade for optimal placement. This system shortens the coil package, easing shipping and storage space concerns, which in turn reduces costs. Improved collection also results in better-shaped coils for fewer tangles and snags at payoff. 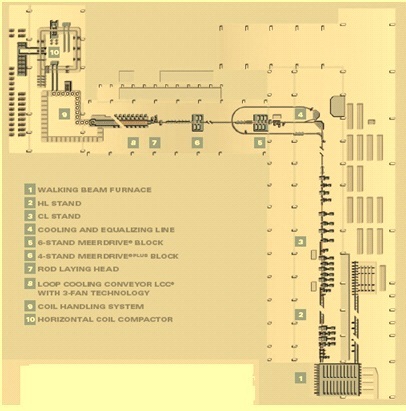 The layout of the modern wire rod mill of Arcelor Mittal at Duisburg Germany is shown at Fig 1. The mill was commissioned in 2012.